Sometimes it’s difficult to figure out where your story starts, the style that fits it, the way it wants to be told. When I was starting the Codename Omega series, I had the pieces of the story. I had fragments of plot and beginnings of characters, but whenever I sat down to start writing, the story faltered. The flame of inspiration sputtered out within a couple of pages. Something just didn’t feel right, just didn’t grab me and make me want to sit down and tell the story. Except that’s not quite true. I definitely wanted to tell the story – but I didn’t want to tell the story this way. When I started writing the first book in the series, I thought it was going to be like the other books I’d written up to that point, Child of the Hive and the book I was at the time trying to find a publisher for, Shadows of Tomorrow. I thought it would be an ensemble story told through a group of characters with a range of different viewpoints. I thought the main characters of the story were going to be Navy, Knight, Princess, and the others of Nuke’s team. But there was a character lingering in the back of my mind. I wanted one of Mrs Grey’s team to switch sides. I knew I had to make sure that the change of allegiances felt genuine, that the character’s justification made sense, and the more I thought about it, the more this character seemed like the interesting one, the one with a story to tell. So I tried again. I sat myself down at the keyboard certain that this time the story would work. I had my new protagonist and it was time for her to get to work. Except the story petered out in the first couple of pages. Again. Something still wasn’t right. I’m not sure how many times I started and stopped that story before it started working for me, but it must have been at least half a dozen, probably more than ten. It was OK though, because I kept trying new angles until I found the one that worked. Something clicked and the story started to flow and before I knew it, I had a first draft. The reason this springs to mind now is that I have another story that’s behaving in the same way. I’ve tried starting this story three times now and it doesn’t feel right. I have a bunch of ideas floating around in my head but they won’t cooperate and get on the page in any way that seems to work, but that doesn’t mean I’m giving up on this story. It just means I have to try and find a new angle. I’m going to try starting in a new place or with a different character, looking at the story from a new perspective. I have all the pieces of a good story as long as I keep trying to find the place to begin. That’s the piece of advice I want to give you: find a different angle. If you’re struggling to know where to start, pick a different character and explain how they got involved in the story, try changing it from first person to third person or vice versa, start it earlier, start it later. It’s OK to get frustrated sometimes, but that doesn’t mean that the story isn’t worth writing. 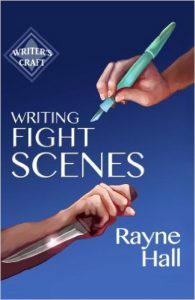 Writing Fight Scenes by Rayne Hall (UK link, US link) is a great resource for writers of action stories. It includes both information on getting the details of a fight correct as well as advice for crafting an action scene in a story. Its subject matter is varied, with a lot of time spent on the use of historical weapons and hand to hand combat, but with pages also devoted to guns, sea battles, and even magical fights. The only types of fights I can think of that aren’t covered are spaceship battles and aerial dogfights. Everything else has a place somewhere in the pages. The information given is clear and concise, making it a straight-forward read, which is always an advantage in a factual book. I read it straight through, but the way it’s organised means you could easily jump to a particular chapter if you wanted advice on, for example, how your werewolf protagonist would fight in their animal form (yes, animal fights are covered too). It’s obvious the author has put a lot of planning and research into this book and it pays off. One thing I liked was the way the author addressed the fact that writing a story is not always realistic. Some genres demand vivid realism, but others want action to be light and fun. The book goes into the different approaches that can be taken, and when either is appropriate (e.g. don’t write gruesome, traumatising realism in a children’s adventure book) as well as how to blend the approaches for a middle ground between drama and reality. This sort of detail is what makes this a book about writing rather than just a book about fighting. The one thing that annoyed me while I was reading though was that it felt like I was only getting half of the content. The book is filled with links out to YouTube videos to show demonstrations of weaponry in use, or examples of fight scenes from movies. This would have been fantastic if this content were given as an online course – the combination of text and video content would work really well – but I first read this book while I was sitting on a plane with my kindle in flight mode. I couldn’t jump out to YouTube every couple of pages to watch a video. In several places, it felt like I was missing out on important information because I couldn’t watch the videos. I understand that author wanting to include extra resources, but I would have preferred it if the text of the book had included more descriptions of what the videos showed so that those readers who couldn’t have internet access could still get the same experience. The same applies to images. There were several points where I thought diagrams or pictures would have been useful, such as when explaining the differences between various sorts of polearms. In a few places there were links out to pictures on the internet but, as with the videos, I couldn’t take advantage of these when I was first reading the book. The book could definitely have been improved by bringing these images into the pages. I do think this book is a thorough and comprehensive guide to writing fights, definitely useful to anyone who wants to learn to write thrillers or other action-heavy stories. Definitely read it when you have an internet connection though if you want to get the full advantage out of it. This post is part of Mystery Thriller Week. Find more book reviews along with trailers, interviews, prizes and more. I’ve written a post in the past about editors and the work they do in turning a unpolished piece of writing into something ready for publication. I’ve worked with a number of different people over the years, some of whom were employed by a specific publishing companies and others who worked independently. If you’re getting published through a publishing company, that publishing company should handle the editing and get your manuscript in front of people with the right skills (not the word “should” – I once had an editor that kept getting past and passed the wrong way round and changing correct instances to the incorrect ones). However, if you’re embarking on self-publishing, you have to find the people with those skills yourself. An internet search will uncover a mountain of resources but it’s hard to know who can be trusted to do a good job. Since I’ve been going through edits recently for the next Codename Omega book and the much sillier Technicality Man story, I thought I would mention a couple of people who have done some great editing work for me. Both of these are people I’m happy to recommend. The first is Ro Smith, who I was once part of a creative writing group with. Since then, she has done work as a professional editor and proof-reader for both philosophy journals and publishing companies. She has been the main editor for two of the Codename Omega books now, including the one which should be coming out early in 2017. Her website is http://www.rhube.co.uk/ and you can find her contact details on that site if you want to work with her. The second person is David Stewart. He was a former colleague who does work, amoung other things, as a librarian, researcher, and editor. He offers proofreading and copy-editing services, or a combination of the two. He is very flexible in offering what might be needed to check, tweak, edit, or reshape work. You can contact him at stewart_dk@hotmail.com if you want to hire him. Both of these people do great work at very fair rates. Over the years, I’ve come across a lot of writing advice from a whole range of sources. Some of the advice I think is good, some I think has merit under some circumstances, and some I think needs to stop being repeated. One piece of advice I’ve seen so many times is this: to be a real writer you must write every day. This just isn’t feasible for a lot of people. Many writers, even professional authors, have another job that takes up a lot of time. There are days when I have to go into the London office and this involves getting up early, catching a bus, train and tube, for a tedious commute. By the time I get home, it’s half-seven in the evening and I still need to get dinner. Once in a while, I get some writing done on the train but there are days when I spend the commute standing so whipping out my laptop and typing up a chapter just wouldn’t work. Writers who have full time jobs to do, kids to look after, elderly family members to take care of, chores to do, or simply lives to live, see this sort of advice and feel guilty, or feel like they’re not really writers after all. So I say: scrap this advice. Instead, figure out what works for you. There is definitely something to be said for a regular writing routine, for having a pattern to stick to, but the pattern can be something more forgiving. For me, Saturday and Sunday mornings are good writing times. I get a lot done then, but if I have family commitments or something else going on, I know that the world isn’t going to end if I don’t get my weekend writing done. Once in a while, I have an overnight stay somewhere for work and there’s not much to do in hotel rooms on my own, so I get lots of writing done then. I have a lot going on with work and other commitments, but I know I can fit writing around them. So don’t worry about writing every day, but have a think about your usual week and figure out if there are any gaps that can be your regular writing time. Above all, remember that if you write, you’re a real writer, even if you only get the time to write once a month or less. I have a short story, Reading Between the Lines, which is coming out in the next Mischief Corner Books anthology. It’s spent the last week going through line editing, so I thought this would be a good time to talk about what line editing is. There are different types of editors who might get involved with your writing, particularly if you get books traditionally published. Two main types are Developmental Editors and Line Editors. I won’t go into detail about developmental editors in this post, but they essentially look at the big picture of a book. Line editors, on the other hand, go down to the details of the writing. They work through the story line by line, looking for any point where word choice is unclear, where the grammar is non-standard, or where the phrasing is clunky. They go through and make corrections or changes to the text. I had someone ask me once if having editors work on my stories made them feel like they weren’t really my stories anymore, and the answer to that is a definite no. Line editing is a collaborative process. When I got my short story back from the line editor, it was as a document with track changes turned on. I had to go through and look at each change and decide if I wanted to accept it. If I thought the change was an improvement, I accepted it. If I disagreed, I wouldn’t accept it and I would leave a comment explaining my point of view. One sentence in this story, the line editor and I went back and fourth on a few times before he agreed to stick to my way of doing things. In the first Codename Omega book, I used the phrase, “after an unbearable eternity” which the line editor objected to because eternity is forever so there could be no after. I was using the word as a hyperbole – when someone says, “that line took forever” or similar, people know it’s being used as a metaphor. I was confident that my readers would know I was using the word “eternity” in the same way to imply the character’s frustration at the length of the wait. As the author, I could say that I wanted that sentence to stay as it was. At other points in a story, a line editor might tell the author that a change needs to be made, but leave it up to the author what the precise change should be. For example, if I use the same word three times in two paragraphs, the line editor would probably point this out and suggest I find a synonym, but not necessary pick the synonym for me. Another time, they might point out a potentially confusing section and suggest a rewrite, but let the author do the rewriting. At the end of the day, the author still has control over the changes that are made but the line editors polish the story up and get rid of the rough edges. It’s an important part of the publishing process. If you’re self-publishing a book, I would strongly advise that you bring a line editor into your project. I’ve recently finished the first draft of the next book in the Codename Omega series so this seemed like a good time to talk about drafts. No one’s first draft is going to be perfect. There may be minor issues where wording isn’t ideal, or major issues where the whole structure of the book needs to be reorganised. There could be sections that need to be cut to keep things from getting dull, or areas that need to be expanded with explanations because character motivations are unclear. You might need to add more descriptions or trim out superfluous adjectives. How many issues and how big they are will vary enormously from writer to writer and from book to book, but it is always important as a writer to look at the first draft with a critical eye and decide what changes need to be made. In some cases, those changes might be sustantial. When I wrote Shadows of Tomorrow, I started with a character who I thought would be the protagonist of my story, and realised several chapters later that all the important plot events were happening to someone else. This meant I had to go back and rewrite the first six chapters of the book to focus on the character who was my real protagonist in order for the story to flow properly. I also changed the gender of one of my characters because the book felt too masculine. This wasn’t as simple as just doing a find and replace on the character’s name – I had to go through extremely carefully and correct all the pronouns (I was still finding incorrect pronouns when the book came back from editing at the publisher). This change also involved making adjustments to scenes where the character interacted with others and the creation of a couple of completely new segments. With Traitor in the Tower, I felt like there wasn’t enough of a climax at the end of the book, so I made substantial changes to the last few chapters. I went even further with Between Yesterdays, when I was advised by a reader to change a section of high action because I introduced a few new elements too near the end of the book, so I ended up throwing out a few chapters and writing replacements. It’s not always so bad though. Omega Rising had no major changes between the first and second drafts. For me, writing the first draft is all about getting the story out of my head and figuring out what the important elements are, who the characters are, and what needs to happen in the plot. The second draft is about fixing the big problems – sorting out the plot holes and the structural issues. The third draft is about making minor changes – clarifying things, making dull sections more gripping, removing unnecessary scenes. Three drafts is usually what I need to get the story ready to go out to the publisher. If as a writer you spend more time on plans and outlines before you start the first draft, it may be that you will have less structural issues that need fixing. If so, you may be able to get away with two drafts. I would be confident in saying though that one will not be enough. Unless you are astonishingly lucky, talented, and careful, there will still be problems and weak parts of the book that need addressing. I think one of the traps writers can fall into, especially when self-publishing, is to stop after one draft. They will write their first draft, give it a superficial edit and a bit of proof-reading, and then put it out their to meet the world. As a reader, I find it immensely sad when I’m reading a book that has great promise but that was released to the world too early. There are books out there that have great premises, interesting characters, and some beautiful writing – but they also have plot holes, confusing sections, and dull points. It’s sad to read books like that because they don’t quite live up to their potential. Do another draft of your books and don’t be scared to make big changes if those will make your book better.